Power Plant XL is a sativa-dominant strain that shines with extraordinary yields, a very short flowering time and an excellent uplifting high. This makes Power Plant XL an ideal strain for cash croppers who want a super-efficient and extremely productive strain without making any compromises. Her aroma, that blends sweet and sour notes perfectly, adds to the stellar impression of Power Plant XL. Power Plant XL: Super-Efficient Dutch Legend Now Improved! Power Plant is a sativa-dominant cannabis strain that was first grown in South Africa in the 1990s. What set Power Plant apart from other strains and instantly made her a favourite of cultivars, among other qualities, is her extraordinary high yields that at times can reach as much as 750g/m². But it’s not only her staggering yields that delighted cultivars as soon as the strain hit the cannabis scene some decades ago. It’s the fact that she is delivering these yields in an impressively short 55 days, making Power Plant one of the most efficient cannabis plants that you can grow. With Power Plant XL, Zambeza Seeds brings us this Dutch legend in a new and improved version. When grown indoors, Power Plant XL will normally reach a height of 80-110cm which makes her still manageable should space be an issue. Outdoors, given that she will get plenty of sun she will show-off some substantial growing vigour and can at times get as tall as 200cm where she’ll reward with a whopping yield of up to 600g per plant. The good thing is that she doesn’t require any specific skills to grow which makes Power Plant XL also a top choice for those with less growing experience. However, Power Plant Xl doesn’t just delight those who grow her. When you smoke Power Plant XL, she will tickle the palate with an excellent blend of sweet and sour notes that has a slight hint of pine to it, making for an excellent smoke that cannabis connoisseurs will love. She will deliver a very powerful yet pleasantly uplifting and euphoric Sativa high that won’t leave a doubt that she’s a true first-class Sativa that unquestionably earned her legendary status! 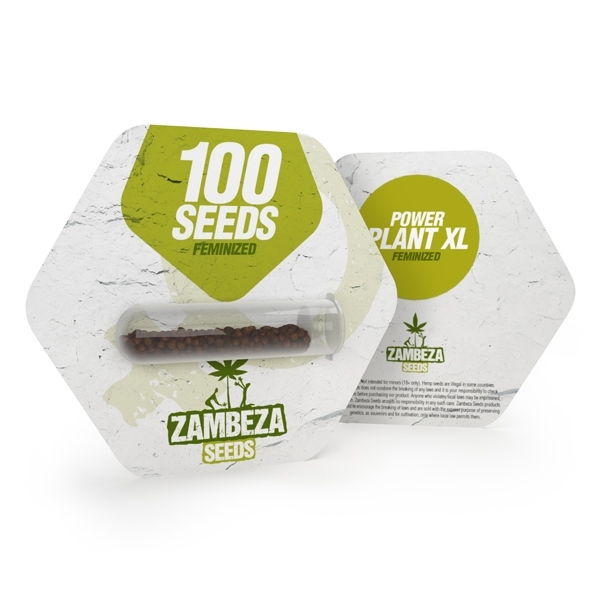 If you want to grow one of the most-efficient Sativas available today, Power Plant XL by Zambeza Bulk Seeds available in economic packs with 100 seeds is an excellent choice!